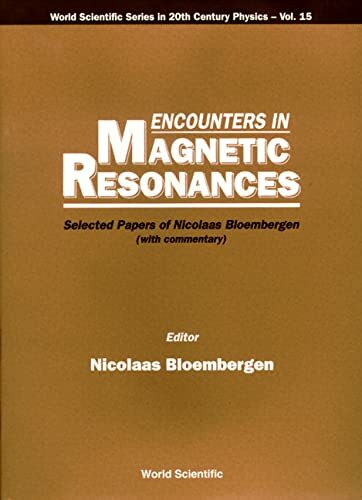 Encounters In Magnetic Resonances: Selected Papers Of Nicolaas Bloembergen (With Commentary) (World Scientific Series In 20Th Century Physics, Vol. 15): 9789810225056 Hardcover - LIMEROCK BOOKS INC. This book presents a selection of papers, written by Nicolaas Bloembergen and his associates during the years 1946-1962, on the subjects of nuclear magnetic relaxation, paramagnetic relaxation and masers, and magnetic resonance spectroscopy of solids. The volume begins with autobiographical notes to provide a personal historical background. Each paper is preceded by commentary with additional information regarding the early development of magnetic resonance in condensed matter. A reproduction of his Ph.D. thesis, "Nuclear Magnetic Relaxation," Leiden, 1948, is included in this volume.